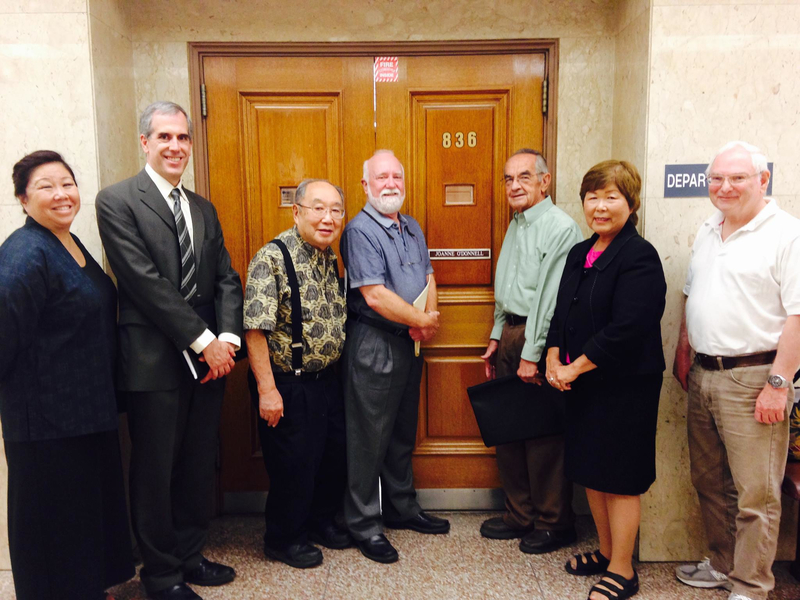 Tuna Canyon Detention Station Coalition members and a city official on hand for Judge Joanne O’Donnell’s ruling were (from left) Nancy Takayama, Ken Bernstein (manager of the Office of Historic Resources and principal city planner of the Department of City Planning), Kanji Sahara, Marc Stirdivant, Lloyd Hitt, Nancy Oda and Bill Skiles. Members of the Tuna Canyon Detention Station Coalition went to the Stanley Mosk Courthouse in downtown Los Angeles on Aug. 12 to hear a ruling on Snowball West’s petition to negate the 2013 resolution by the City Council to set aside one acre of land for a memorial to the Tuna Canyon Detention Station. In a tentative ruling, Judge Joanne O’Donnell denied the petition. Then Snowball West’s lawyer, Fred Gaines, argued that the 2013 resolution was faulty because the one acre of land was just a geometric shape that was drawn on a photograph. He repeatedly said that “perhaps” detainees sat under the mature oak trees as indicated by the environmental impact report. He further said that a memorial cannot be built with such imprecise information. Located in Tujunga and formerly a Civilian Conservation Corps camp, Tuna Canyon was converted into a detention center for Japanese, German and Italian immigrants during World War II. There are no buildings from that era on the site, now occupied by the Verdugo Hills Golf Course, but proponents of historic landmark status said that aerial photographs confirm that a grove of oak trees on the course dates back to World War II. They also argued that other locations in Los Angeles have been given landmark status even in cases where the original buildings no longer existed. Snowball West, which owns the property, has acknowledged the historical significance of Tuna Canyon but has maintained that formal landmark status will place too many restrictions on development. Deputy City Attorney Tayo Popoola said on Aug. 15 that the court’s official ruling was the same as the tentative ruling — to deny the writ. Gaines could not immediately be reached for comment on the latest development. If Snowball West appeals the decision and is successful, the current City Council will review the issue. Although the 2013 council voted unanimously in favor of the resolution, introduced by then-Councilmember Richard Alarcon, the composition of the council has since changed. Coalition board members present for the ruling were Lloyd Hitt (chairman), Nancy Oda (president), Bill Skiles, Marc Stirdivant, Nancy Takayama (treasurer) and Kanji Sahara (vice president). O’Donnell is the third judge on this case. Luis Lavin, the first judge in the case, ruled that the 2013 resolution was a “legislative” matter. O’Donnell ruled that the resolution was an “administrative” matter. If the resolution was a legislative matter, then the judiciary has less oversight. The Tuna Canyon Detention Station Coalition is dedicated to education and to raising public awareness about the detention that was a violation of civil liberties and to the continuing struggle of all peoples. It plays a key role in the development of the Tuna Canyon Detention Station Memorial at 6433 La Tuna Canyon Rd., Tujunga. For more information, call (818) 935-2603 or visit www.tunacanyon.org.